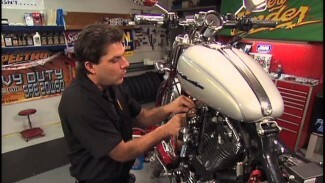 There are many reasons for Harley gas tank removal on a Milwaukee Eight. Until now, removing the Harley gas tank was typically done to perform repair work. On an M8 model, the Harley gas tank will also need to be removed for a regular service procedure; spark plug replacement. The M8 has four spark plugs; two per cylinder because, like it’s name, the M8 has 8 valves. Four valves per cylinder. Two of the spark plugs are in the same left side location as always. These two spark plugs are easy to access. The other two spark plugs can only be accessed by completely removing the fuel tank. In years past, Harley gas tank removal was a little more involved. 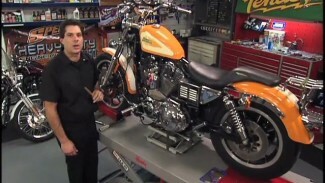 However, in more recent years, Harley Davidson has made fuel tank removal increasingly easier. If you are planning to remove your fuel tank to replace spark plugs or for any other reason, we would highly recommend making removal of the fuel tank your starting point. When working this way, your painted component will be out of harm’s way for the duration of the job. Not only will you be able to access the spark plugs, but the fuel tank will also be safe from possible, damaging brake fluid or an unexpected slip of a wrench. Always be sure to set your painted components in a safe location away from your work area. Set components on a soft, clean surface and cover them. On a touring model, start by removing your left side saddle bag and the passenger seat strap. Open the tour pack lid to access the seat retaining screw and remove the seat. It is recommended that the correct service manual procedures are followed for depressurizing the fuel system. This means, removing the correct fuse to cut power to the fuel pump. Then, start and run the bike until it stalls. See the full procedure per the manual here. Push up on the quick connect fitting and pull down on the fuel output line to separate the two. Next, remove the dash console. It is easier if you have a 5/32″ long ball allen for the forward most retaining screw. Remove the four retaining screws that secure the fuel tank to the frame. Carefully lift the Harley gas tank away from the motorcycle and set in a safe location.